Discuss Cooking - Cooking Forums - Dinner Friday, 3-27-2015 ~ Friday, Friday! Baked fish and leftover spinach. 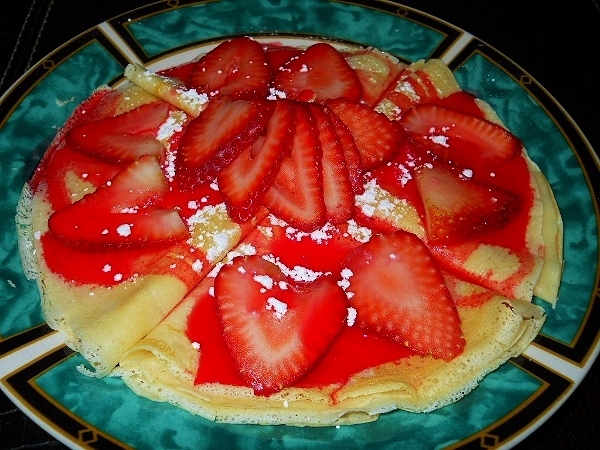 I made strawberry crepes, but I think I may have to find something more for later! I have a couple of turkey thighs for dinner. I'll roast them and make some pilaf to go with them. Grilled tri tip, roasted yams sprinkled with cinnamon, and cauliflower will be this afternoon's dinner. We have leftover coconut crusted lion fish that we were way undercharged for last night, a substantial chunk of leftover cheesecake, and some yogurt. We ate dessert several hours ago, local coconut ice cream! Joey, with a dessert that looks that yummy, I think it's a good plan to eat it first. You want to make sure there is room for it. You can adjust the quantity on whatever you have later to the amount of space in your tummy. Those look like Perfect Crepes ! We had pub grub at a local sports bar. DxW had a Rueben sandwich and I had AYCE beer battered fish. I had 2 pieces (ha). Both came with fries and cole slaw. Could have subbed green beans for fries, but we both looked at each other and said huh, we have those at home all the time. The crab cakes were so good, I had to share a pic. My photo will not be as good as s&p's. Joey, those crepes look so delicious! ...........Grilled tri tip, roasted yams sprinkled with cinnamon, and cauliflower will be this afternoon's dinner.